I received an email last week from Dior asking me if I would like to review their "Miss Dior Blooming Bouquet Eau de Toilette", and as a Dior fan, I obviously said yes! 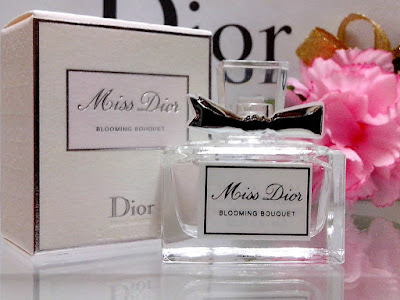 A couple of days later I received a sample bottle of Miss Dior Blooming Bouquet Eau de Toilette and opened it straight away. I usually wait a little while with perfumes as I like to usually use a perfume at a time when a company asked me do a review but I was so excited to try this one as I had never used or smelt it before. A tribute to Christian Dior's love of flowers, Miss Dior Blooming Bouquet is a fresh and delicate blend of mandarin and floral essence, the perfect touch to your summer wardrobe. The packaging of this is beautiful, a pretty pale pink colour with silver writing. The bottle is glass and has a beautiful bow design on it. The fragrance itself is a modern, elegant and exuberant floral scent. I personally think it smells beautiful. I also received a very beautiful little card telling me all about the perfume and thanking me for doing the review. I will definitely be putting this on show in my make up room. The perfume is available as 50 ml Eau de Toilette and 100ml Eau de Toilette. You can buy Miss Dior Blooming Bouquet Eau de Toilette on the John Lewis website by clicking here for £56.50-£79.50 depending on which size bottle you wanted. Don't forget to visit your nearest Dior counter to discover the complete Miss Dior fragrance collection and the bath and body range. 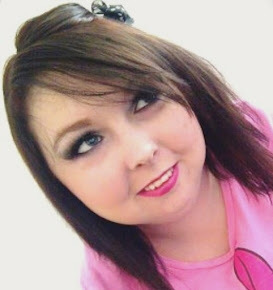 I hope you all enjoyed this blog, and I hope you all have a wonderful day!